We were delighted to be visited by a group of students from George Mason University last week, as part of their cultural visit to London. They attended a talk on the history of British theatre from Andrew Dickson and a talk on Theatre criticism with Sarah Hemming. 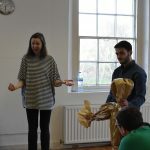 They also had a workshop with Hannah Barrie on puppetry, leading on from their visit to watch War Horse. Here are some photos of their workshop with Hannah!